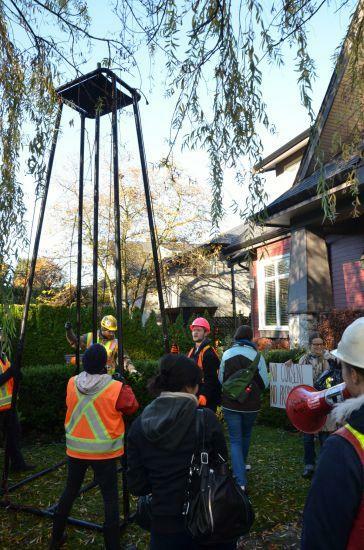 Premier Christy Clark says demonstrators were out of line when they raised a fake rig on the lawn of her home to protest against her support for hydraulic fracturing as a way to extract natural gas from rock. In her first comments about the weekend incident, Ms. Clark said on Wednesday that she was at home making French toast for her 12-year-old when the protesters turned up. “I don’t think it’s great for a 12-year-old to think they have to navigate a group of 30 angry people on the front lawn in order to get out of the house on a Sunday,” Ms. Clark said at an unrelated news conference. The protesters were from Rising Tide Vancouver Coast Salish, and were making the case that hydraulic fracturing, often referred to as fracking, is too risky for the environment. Spokespersons for the group told reporters they wanted to bring the issue to Ms. Clark’s doorstep in central Vancouver. Media reports suggested about a dozen protesters were on hand and that they removed their prop when advised by Vancouver police they were on private property. Exploiting LNG was a key plank for Ms. Clark’s Liberals during the provincial election earlier this year. The party won a fourth straight majority, and it has become a policy priority for the Liberals in power. Alberta Premier Alison Redford, who was in Vancouver this week to speak about energy to the city’s board of trade and reach an agreement on energy with Ms. Clark, said in her speech to the organization that she thought the actions of the protesters inappropriate.